February February 2 is World Wetlands Day. The Kandalaksha bay, White Sea is one of the celebrating. The wetlands of international importance are sites recognized as standarts of rare or unique natural wetland ecosystems. WSBS MSU is lucky: the Kandalaksha bay, where the biostation is located, is one of such valuable sites, recognised by the international Ramsar Convention on Wetlands. 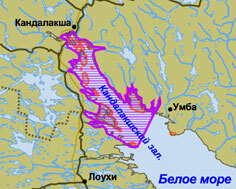 In 1994, the government of the Russian Federation issued a bylaw № 1050 which listed 35 Ramsar wetlands, including the Kandalaksha Bay of the White Sea. The site is huge – 208 thousands hectars, it covers the bay from the top to the Kemuldy and the Umba river. The bay's main treasure is the winding coastline with a lot of islands, straits, shallow waters, and a wide littoral. All this has formed comfortable conditions for massive nesting of ordinary eiders from the White Sea population, along with lots of other natatorial and coastal birds. The bay has a lot of traditional places where drakes of diving ducks and mergansers molt, as well as sites which are rest stops for large numbers of transitory birds. Even now, when almost the whole bay is covered with a thick layer of ice, there is still a gully left in front of the WSBS MSU settlement. There, despite of the cold, thrive several hundreds of eiders and long-tailed ducks. Our eiders are part of the White Sea population, they come here every year to spend the winter. The long-tailed ducks come from the east and north. The WSBS area is their "warm south".